I pray everyone had a satisfactory Christmas. We tried our best here to have one. We ended up having to take two of us to the ER before the day was over, but everyone is OK..
Kim left today. Lexi has been here for days and that is always nice even if she is sick. At least we get to see her. We all dressed up in Christmas cloths and wore silly musical hats, opened our presents had Christmas meals and so forth. Everyone seemed pleased with what they received and overall it was a pretty good day. Karen has not received her bonus yet, and my checks are late so we where not able to do everything we wanted to do. I guess we can just do it when the money finally arrives? We are all home sick today, Karen came home from work yesterday and got worse over night. I pray she gets better soon. I have an egd scheduled for the 14th of next month to continue in my diagnoses prognoses. I am still having issues swallowing and keeping anything in me. They did find abnormal cells during my cat scan. My muscles still lock up now and then and driving is still difficult but not impossible. Sun-downers is a bummer and it comes early some days. i have to find a way to get 30 semester hours in before the 5th of January, wish me luck lol. I am signing on with a couple insurance companies again and planning to open an insurance agency in Tuscola and Abilene after the first. wish me luck there as well.. I have a site already up for Texas life and health Frank Toms insurance agency click me!! I hope i can get back into that, it is alot less work and the pay is ok.. I have not seen my daughter in a while . It is making me crazy. but God is helping me.. I hope everyone has an awesome holiday season and the new year brings new and better things to all of us. I need to go lay down again. The Alzheimer's Association has released guidance to help health care providers detect cognitive impairment as part of the Medicare Annual Wellness Visit. Physicians are required to include detection of cognitive impairment as part of the visit, but there had been no comprehensive guidance to them on how to accomplish it. People with Alzheimer's disease with adult children or other non-spouses serving as caregivers may be under-represented in clinical trials, and spousal caregivers may be over-represented, which could impact study results, a new study shows. Among their findings, researchers said that fewer adult child and non-spouse caregivers lived with the person with Alzheimer's, which suggests increased logistical challenges to participating in research. Caregiving brings physical, mental and emotional challenges. Everyone can use a break; respite services also can support and strengthen caregivers' ability to continue taking care of family members or friends with Alzheimer's. To change your email preferences click here. A third donor just stepped up with another year-end matching gift challenge! 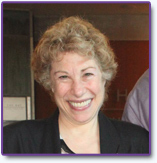 Abbe Sue Rubin will donate $25,000 to the Alzheimer's Association if we can raise that same amount online by December 31. 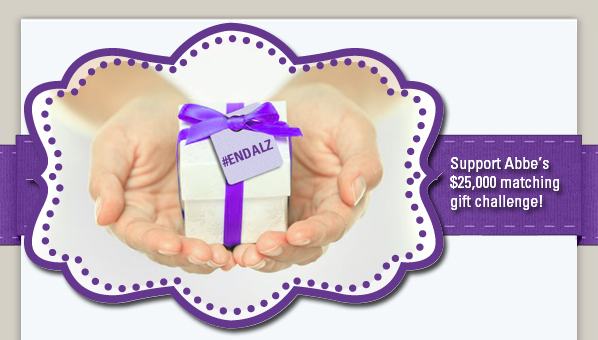 I can't think of a better time to make a donation to the Alzheimer's Association. The generosity doesn't stop there. A second donor just stepped up with another year-end matching gift challenge! Both Tina and Karl Weber have been long-time supporters of the Alzheimer's Association, and this year marks the THIRD year in a row that they have graciously offered a matching gift challenge. Abbe's passion for fighting Alzheimer's disease led her to the Association's Western and Central Washington State Chapter where she volunteers and serves as the chapter board's treasurer. Her gift will support public policy initiatives. Abbe knows firsthand the terrible toll Alzheimer's can take on an individual and his or her family. "Onward! ", her rallying cry, is an inspirational call to action in the fight against this devastating disease. Friend, there are only four days left in 2012 to make a tax-deductible contribution – and your donation can have twice the impact thanks to Abbe's gift. Don't let the year end without taking a stand against Alzheimer's. Please give as generously as you can. P.S. There are just a few days left in the year. Don't miss this chance to make a gift that can make double the impact and receive a charitable deduction on your 2012 tax return. Give today. The Alzheimer's Association is the world's leading voluntary health organization in Alzheimer's care, support and research. Our mission is to eliminate Alzheimer's disease through the advancement of research; to provide and enhance care and support for all affected; and to reduce the risk of dementia through the promotion of brain health. Our vision is a world without Alzheimer's disease. © 2012 Alzheimer's Association. All rights reserved. I receive alz newsletters from our local group that my wonderful wife and I are a member of and once a month from the national org news letter and as a former intern I get the Johns Hopkins news letter as well. Sometimes I wish i would have actually finished my dream of becoming an MD. All those years of studying and working weird shifts for nothing. But i did have a lot of wonderful experiences in there mixed up with depressing ones lol. I just don't have that professional detachment required.I get to close to patients and take everything too personal. When one of them does not make it i take it personally. That time they unplugged our patient in New Mexico was the last straw for me. He came in with respiratory distress, they made mistakes, punctured his lung, sent him into cardiac arrest, put him on life support then unplugged him when they could not find next of kin or insurance proof.. Only to have them arrive 12 hours later and sue the hospital.... I walked out and never went back... There where way to many incidents where i lost my temper and over reacted to things as well since i could not detach myself from the patients.. Specifically domestic violence. so, I guess it is a good thing i went on to fly airplanes instead lol and eventually branch out to all these other weird things i do.. A propensity for languages , communications, computer and networking seems to be a strong point as well as logistics for me. My pleasures are acting , singing , dancing, performing arts of any kind playing any musical instrument, entertaining , being on stage or in the movies has always been where i am in my realm. I also love online gaming, specifically first person shooters and role playing games. strategy games. I also enjoy solving mysteries. we watch every type of crime and mystery show there is and I can usually figure it out before the second commercial lol.. I love insurance because i understand it and why we need it.. my weakness is understanding why everyone does not have it and how people can say no??? My health is not doing so well.. I have had some sort of issue from my throat to my but for about three months now. they found abnormal cells in my duodenum so its more tests after new year.. I am at a loss since they where just in there a few months ago?? anyway... I feel like I swallowed a gerbil.. I cant swallow diet coke my favorite drink now for some reason... I think it is the bubbles??? I think i'm allergic to my tooth glue? so old age and ad is not being nice to me lol. I love my Karen, but she forgets I have alz and expects me to call and order it when i run out. She said, i told you last week, i'm like, OK... um honey, I have Alzheimer s... remember?? that's what the medicine i ran out of is for... God bless her she is getting old too . She is so wonderful and I love her with all my heart. i had them put it on an auto refill today so that neither one of us will have to remember lol. The holiday's are coming. 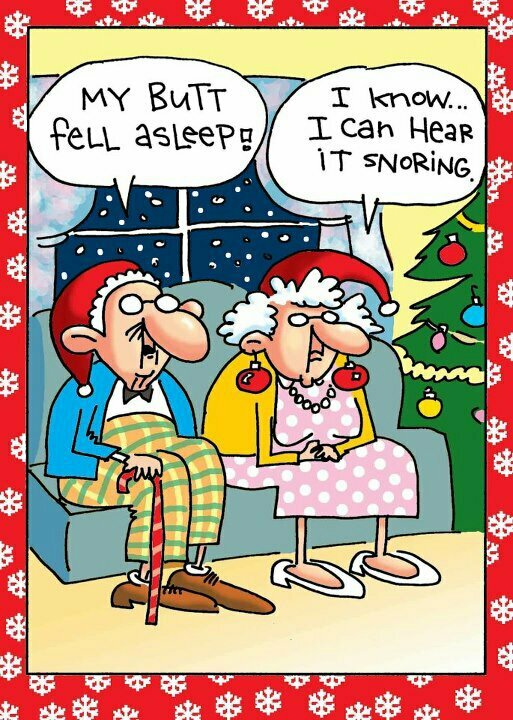 I can't help but wonder if this is my last Christmas that I will remember?? and even If i will remember it. I vaguely remember last Christmas.. I have hated this season since I was 9. I was taken from my mother on my 9th birthday and did not see her for almost a year. that first Christmas i spent alone in an orphanage. No presents, no songs, nothing.. three hots and a cot... All the other children had paces to go but me. Every Christmas after that until i got to go home I received girls toys because my Catholic name was Francis not frank. and people did not know that Francis is a boy and Frances is a girl so i got made fun of and got dolls and dresses for Christmas every year.. then, in 1997 my mother died on Christmas eve three hours after people burned my bar to the ground..... so no i don't like Christmas very much to begin with..
add the over commercialization over the past 20 years. now , every year we try to outdo the year before. We spend too much money, put our self in horrible debt that we struggle to get out of for the rest of the year for what?? Buying material things for people is NOT LOVE, it does not take the place of a hug, holding them and telling them you love them forgiving them their transgressions, sitting with them and listening to them praying for and with them. sharing the word and meaning it. I dont know what happened to this country. I pray i make another year on earth and know who I am. I pray i get to see my children again before I forget who they are and who I am. I pray I don't suffer a long painful death. I love unconditionally and wish someone could love me the same way. I miss having a cup of hot tea every nite before bed and at 6pm English style tea time..
she shares her food the same way, and acts a lot like her she even likes the same food as my mom. kind of odd.. I did not know any of that when we met and fell in love, it all came out over the past 4 years. I fell blessed to be accepted into her work book study program. They are like a family to me. All of my blood relatives with exception of one cousin and my youngest daughter are deceased.. And I have not seen my youngest daughter in over a year, so i need family bad..
Lexi comes by now and then and spends time with me so that's good. So all in all it is mostly Karen and I. Which is a good thing I guess. Gives us time to bond. We enjoy each others company. my muscles are getting worse. I get tired earlier in teh day. driving is becmming more difficult and my temper seems to be getting worse. We do pretty good most of the time. WE don't cheat and don't mod but we do trash talk a lot,. most of the guys are handicapped/disabled in one way or another, many are military or prior military, combat trained so we can usually do well in a team environment three teams of two choking off the choke points and keeping the enemy pissed off lol. I used to be able to crank out 30 semester hours in 3 days. now it will probably take me two weeeks , wish me luck! Lilly going back to the drawing board, maybe this time we can get a better test? Eli Lilly & Company has announced it plans additional study of solanezumab, an experimental Alzheimer's drug that previously failed to improve the condition of people with the disease. The company released results of two clinical trials in August that showed the drug did not significantly improve cognition or daily mental function of people with mild and moderate Alzheimer's. However, when the results for people with mild Alzheimer's were separated out, they showed the drug did slow cognitive decline. Tania Richard was a caregiver for her mother, who was diagnosed with dementia in 2011 and passed away the following year. During her mother's illness, her father was hospitalized with lung cancer. Tania and her sister, Gina, found themselves embracing the challenge of caring for their parents, who were in separate hospitals in different cities. Young people may sometimes focus on the gifts they'll receive for their birthday. An 11-year-old Florida girl, whose great-grandmother has Alzheimer's and lives in a nursing home, rejected gifts for her 12th birthday and instead requested donations for senior citizens.